89th Lithuanian championship took place in the capital of Lithuania, Vilnius. 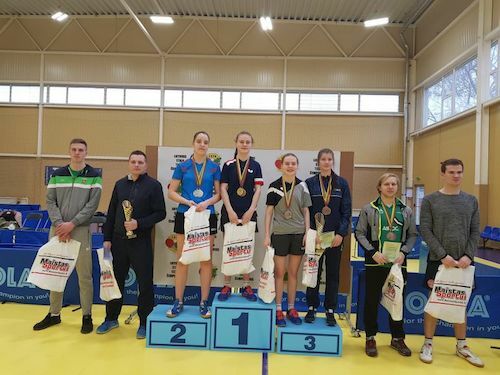 Kornelija RILISKYTE for the first and Alfredas UDRA for the fifth time won Lithuanian National Championships. In the final game Kornelija RILISKYTE 4:1 (11:9, 9:11, 11:7, 11:4, 11:3) won against Auguste MELAIKAITE. 3rd place winners are Ugne BASKUTYTE and Emilija RILISKYTE. The winner of men's singles event is Alfredas UDRA. He won final game against last year champion Medardas STANKEVICIUS 4:1 (11:9, 11:6, 11:8, 6:11, 11:6). 3rd place winners are Valdas MARTINKUS and Matas VILKAS. Egle JANKAUSKIENE and Vitalija VENCKUTE won the champions title in women's doubles event, after they beat Auguste MELAIKAITE and Andzelika PETRAUSKIENE. 3rd place winners: Ugne BASKUTYTE and Aukse RASIMAVICIENE; Emilija and Kornelija RILISKYTE's. The gold medallists in men's doubles event became Alfredas and Manfredas UDRA's. Silver medal winners are Agnius KACERAUSKAS and Medardas STANKEVICIUS. 3rd place winners: Arnoldas and Tonetas DOMEIKA's; Rimas LESIV and Kestutis ZEIMYS. The mixed doubles champions Kornelija RILISKYTE and Alfredas UDRA won against Emilija RILISKYTE and Matas SKUCAS in the finals. 3rd place winners: Vitalija Venckute and Matas VILKAS; Ugne BASKUTYTE and Medardas Stankevicius. "Championships was full of beautiful matches and emotions. We want to thank for all participant and atmosphere that they gave and also to everyone who worked to have this championships in such high level" said Egle KAZYTE.